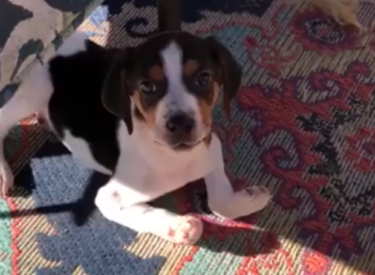 STILLWATER, Okla. (AP) – A puppy named Milo born with his front paws facing up instead of down has had another procedure as veterinarians in Oklahoma try to help the dog learn to walk. Dr. Erik Clary says Milo, apparently part beagle and coonhound, suffered from congenital elbow dislocation. Clary did Milo’s first surgery on January 9th, inserting pins in the dog’s elbows to realign the joints. The splints and pins were removed Monday. Clary says the alignment appears to be working, but Milo still needs rehab to improve joint function and strengthen his limb muscles.